Lucky McKee made his directorial debut with the 2002 independent horror film May, which he also wrote. The film starred the brilliant Angela Bettis as a lonely girl looking for the perfect friend, and was widely recognized as one of the most impressive and unforgettable debuts in the horror genre. 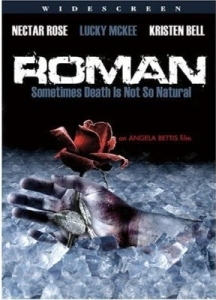 Roman (2006) is McKee’s second feature film as a writer. This time around, May star Bettis takes a turn behind the camera and McKee stars in the film. McKee actually wrote Roman in the mid-1990s when he was a student at USC film school. It’s a story about a quiet, socially awkward and painfully introverted man named Roman (Lucky McKee). He’s trapped in a life of tedium as a welder in a local factory. His co-workers torment and tease him because he’s so different. He has trouble relating to people and doesn’t even own a television. Yet he yearns to find love, happiness and companionship. Roman develops an obsession with his beautiful neighbor (Kristen Bell). When a chance encounter with the object of his affection goes horribly wrong, a chilling turn of events leads to a murder, a disturbing cover-up, and a new love affair with another neighbor named Eva (Nectar Rose). Unfortunately, Eva is hiding her own dark secrets, leading to devastating consequences. The film was shot on a micro budget and definitely has that sort of gritty not glossy feel. Interestingly, the look of the film and its low budget production values actually works in its favor, giving the film a very realistic and intimate feel. Bettis does an exceptional job creating atmosphere and using a balance of light and dark to reflect character moods and situations. The sharp contrast of the gloomy, indoor settings (Roman’s cramped, sparsely decorated apartment and the factory where he works) to the bright and vivid outdoor settings mirrors Roman’s own inner conflict. At times, he is wrestling with feelings of isolation and deep despair. Other times, he feels hopeful, alive, and fully connected to another human being. It’s masterfully executed. Roman benefits tremendously from the considerable talents of its small cast. McKee delivers a remarkably strong performance as the titular character, portraying him as a withdrawn and ultimately sympathetic man. In spite of some very bad actions and undeniably creepy behavior, you still manage to care about him and find yourself hoping things will work out in the end (though it’s glaringly obvious pretty early on that’s not in the cards for him). Roman’s two love interests in the film are played by (at the time, newcomer) Kristen Bell and Nectar Rose. Bell’s role is small but crucial. She shines as the innocent and endearing beauty that captivates Roman’s heart. She basically represents Roman’s dream girl, and her main job is to be lovely and charming and easy to fall for. But she really excels when the movie takes its darkest turn. Her biggest scene is the most pivotal one in the movie, and she does a remarkable job conveying the chilling and deeply unsettling nature of the unfolding events. Nectar Rose is Eva, a complex character who is at once vibrant and full of vitality and yet utterly consumed with thoughts of death. She’s charmingly quirky, loveable, joyful and energetic. She wears long flowing dresses, decorates her body with foliage and paints flowers on her face. She’s difficult not to be completely captivated with, and she’s easy for Roman to fall for. But her obsession with death also makes him uneasy, and it’s difficult for him (and for us as an audience) to reconcile those two dichotomous sides of her character. Rose plays Eva to perfection and manages to flawlessly sell both her infectious light as well as her hidden darkness. You’ll probably see the ending coming, as the film pretty clearly highlights the path it’s on once things really get rolling. But you may be shocked at how impactful and moving the final scene truly is. This film is at once deeply disturbing, darkly funny, and tragically beautiful. In many ways, it feels very reminiscent of May. They both have a similar quirky style, both defy genre categorization, and both focus on unusual characters that are social outcasts with penchants for weird and troubling behavior. However, the hearts of the two films are very different. May was a depraved search for love with darker horror undertones. Roman is really about grieving and coming to terms with death. Though it has horror and dark comedy elements, it’s much more sincere and, ultimately, heartbreaking. Roman isn’t nearly as polished as May, and it’s not as easily accessible for most audiences. It’s a weird and doesn’t have a lot of mainstream sensibility. The pacing is purposefully quite slow, and it takes some time to get where it’s going. But, in spite of all that, it’s a truly compelling watch and one of the more remarkable independent films out there.